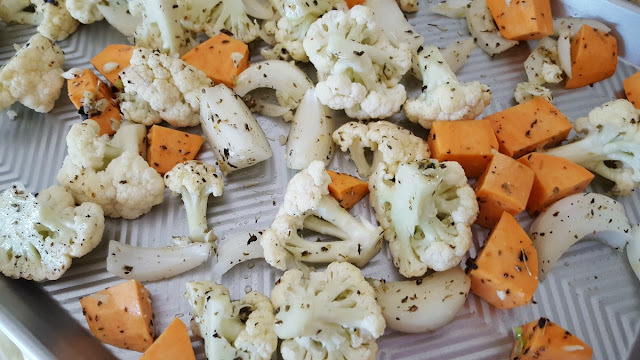 Roasting vegetables is one of my favorite ways to prepare vegetables. It is absolutely my favorite way to prepare cauliflower. 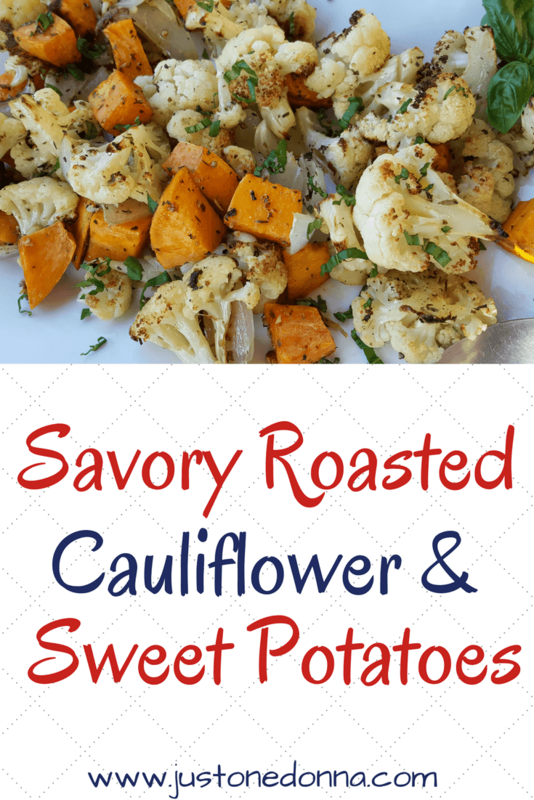 Roasting takes cauliflower from meh to yummy in no time at all! 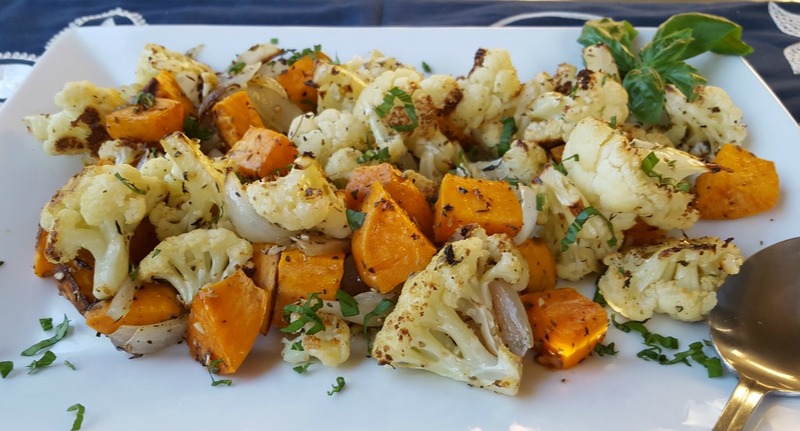 The combination of cauliflower with sweet potatoes is the yummiest and I make it even better with some onion, garlic, and herbs. I love this combination so much I can make a meal of it. The edges of the cauliflower caramelize in the roasting process making the little florets sweet as can be. That caramelized sweetness blends beautifully with the natural sweetness of the sweet potato. The olive oil mixed with garlic, onion, and herbs add a touch of savory flavor to the dish that will keep you wanting more. Prepare the cauliflower, sweet potato, and onion. Place in a large bowl. Heat the oil in a small skillet over medium heat until warm. Add the garlic and herbs. When the mixture begins to sizzle remove the pan from the heat and set aside to cool. While the oil mixture is cooling, preheat the oven to 400 degrees F.
Pour the cooled oil mixture over the vegetables in the bowl and toss until all the vegetables are coated with the oil and herb mixture. Add salt and pepper to taste. Pour the vegetable mixture onto a sheet pan and place on the center rack of your oven. Roast the vegetables for 30-40 minutes, until the vegetables are caramelized and fragrant. Toss mid-way through. Garnish with chopped fresh parsley or basil. Serve hot or at room temperature. Thank you for sharing this recipe on Facebook, Pinterest, Twitter, and Yum.